It was a better weekend for the UNO hockey team as they were able to split their series against the Western Michigan Broncos at Baxter Arena. On Friday, the Mavericks (8-16-2, 4-11-1-1) got off to a fast start with a goal from Mason Morelli in the 1st period, followed by Taylor Ward in the 2nd period. The Broncos were able to equalize, and then take the lead with .3 seconds left in the 2nd period on a goal from Ethen Frank. In a rough-and-tumble 3rd period, the Mavericks were able to tie it 3-3 on a beautiful goal from Travis Kothenbeutel. Unfortunately, in the final minute of the game, Nate Knoepke was called for roughing, setting up another goal from Ethen Frank with 13.7 seconds left in the game to win it for the Broncos — giving WMU the 4-3 victory. It was a different story on Saturday night. UNO got out to a 2-0 lead on goals from Tyler Weiss and Fredrik Olofsson, and did not trail for the rest of the night, padding their lead with three goals in the 2nd period and then scoring an empty netter in the 3rd period to seal the deal 6-3. Mason Morelli and Olofsson had two goals each on the night, with an additional goal by Tristan Keck. WMU goals came from Austin Rueschhoff, Wade Allison, and Colt Conrad. It was definitely a step up in the energy level from the Mavericks this weekend. The team played with intensity throughout both games. And, while they played sloppy at times, they never quit. They will need to keep this mentality for the rest of the season and into the conference tourney. Looking for a more in-depth look at the Western Michigan series? Take a listen to the "Mavpuckcast with Jason and Jon!" They also peek ahead to the Miami series and take a look at what it takes for UNO to play on the road versus at home. Speaking of Miami, the Mavericks travel to Oxford, Ohio, this weekend to take on the RedHawks (9-15-4, 3-11-2-1). Miami has not looked good since the holiday break, not winning a single game from January onwards (0-9-1). Last weekend, the RedHawks were swept by St. Cloud State 5-1 both games. 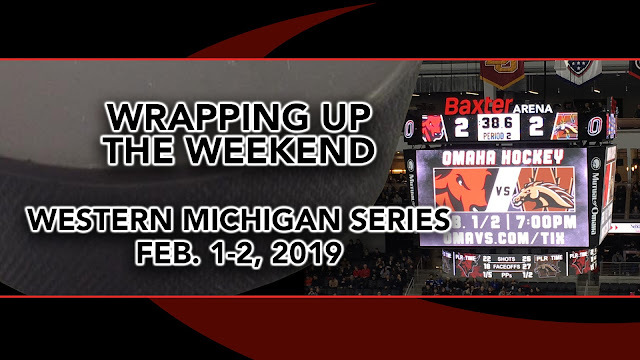 Coach Rico Blasi’s team will be looking to break that streak with a win or two over the Mavericks, while the Maverick team will be trying to continue its slow climb out of the bottom of the NCHC rankings. Look for another rough-and-tumble weekend, as both teams mutually dislike each other. Denver won Friday and “won the tie” Saturday against North Dakota in its tough rivalry series. In the tie, Brett Stapley scored for Denver in the 3x3 overtime period, earning the Pioneers the extra NCHC point. 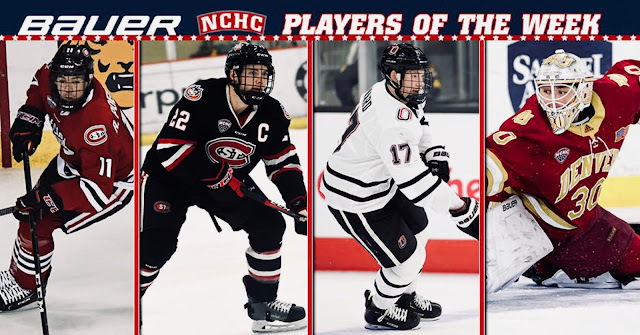 UNO again did not receive votes in either the USCHO.com or USA Today/USA Hockey Coaches’ Polls. Connor Willingham is a periodic contributor to Mavpuck.com and a moderator of the Mavpuck Facebook group. He graduated from UNO in 2014 and is an avid follower of UNO and college hockey. You can find him on Twitter at @INTLMAV.